Islamic banking is apparently being rebranded with a new name, "participation banking," at leat according to the World Islamic Banking Competitiveness Report 2014–15: Participation Banking 2.0, which is published by the firm that used to be called Ernst & Young, before it was rebranded to EY in 2013. The idea of Islamic banking has been around for awhile now: for example, the Journal of Economic Perspectives (where I've worked since 1987 as managing editor) ran an article touching on the subject back in the Fall 1995 issue "Islamic Economics and the Islamic Subeconomy" (9:4, 155-173). Then as now, there is some contoversy over the extent to which Islamic banking involves changing the labels on financial contracts without (much) altering the financial flows, or whether it represents a fundamentally different kind of banking arrangement. I remember talking to a friend at a U.S. mortgage financing firm who told me that if someone walks in the door and wants to apply for a mortgage, he would reach into a file in his desk and pull out the paperwork. If they said they wanted an Islamic mortgage, he would reach into a different file in his desk and pull out differentpaperwork with different wording and a religious stap of approval--but from the company's internal accounting point of view, the two sets of paperwork described identical obligations about payments. the balance sheet as we will discuss below. ... Together, our empirical findings suggest that conventional and Islamic banks are more alike than previously thought. Differences in business models – if they exist at all – do not show in standard indicators based on financial statement information. Other differences, such as cost efficiency, seem to be driven more by country rather than bank type differences. The literature on Islamic banking does not specify how a depositor and his bank, or the bank and a borrower, are to apportion risk. It insists only that each of the parties to a financial contract must bear some share of the risk. In principle, one side could carry just one-twentieth of the risk, although some writers caution that the risk shares must conform to customary notions of fairness. Thus, Islamic banks accept various kinds of deposits, which have varying degrees of participation in profits that a bank earns from its lending. However, while the "profit share" received by ordinary bank depositors typically does fluctuate a bit in the short-term, it looks a lot like an interest payment in the medium- and the long-run. Indeed, some Islamic banks also pay "bonuses" to depositors when they feel it is useful. Let us say a cash-poor industrialist needs a new computer. His Islamic bank buys the computer, marks up its price, and then transfers to him the computer's ownership; in return, our industrialist agrees to pay the bank the marked-up price in a year's time. If the predetermined markup rate were identical to the prevailing interest rate, this murābaha contract would be essentially equivalent to an interest-based contract. But there would still be one difference, which Islamic economics considers critical: during the period when the computer was owned by the bank, the bank would carry all the risks of ownership, including those of theft, fire, and breakage. In practice, however, the bank's ownership generally lasts just a few seconds, so its exposure to risk is negligible. Ordinarily, therefore, murābaha serves as a cumbersome form of interest. Similarly, operating leases (Ijara) where the bank keeps ownership of the investment good and rents it to the client for a fee are feasible financial transactions under Sharia-law. While the discounting of IOUs and promissory notes is not allowed under Sharia-law as it would involve indirect interest rate payments, a similar structure can be achieved by splitting such an operation into two contracts, with full payment of the amount of the IOU on the one hand, and a fee or commission for this pre-payment, on the other hand. In short, Islamic banking is also "participation banking" because it requires a degree of participation by bank depositors, banks, and those who are receiving financing. But the extent of participation often seems to be flexible. The EY report sidesteps these kinds of issues completely, but offers some snapshots of the current size of the Islamic banking or participation banking sector, and some business challenges confronting it. 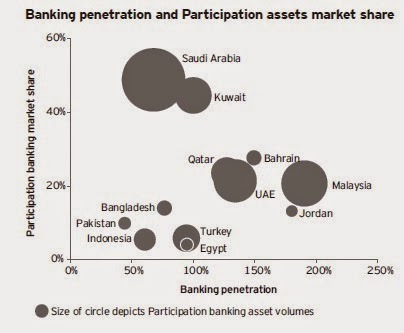 Apparently Islamic banks in six countries -- Qatar, Indonesia, Malaysia, Saudi Arabia Turkey, and UAE -- represent over 80% of the global assets of "participation" banks. 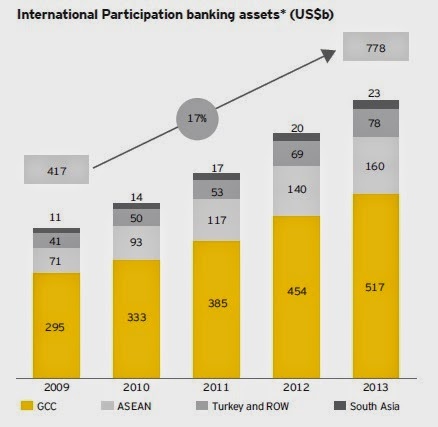 Growth in participation banking has been rapid in recent years. However, participation banking remains a minority of the banking sector in most countries where it exists (as shown on the vertical axis). Thus, Islamic banks must compete against conventional banks. Although Islamic banking has been growing briskly, the EY report notes two difficulties for participation banks looking ahead. First, the return on equity has been slightly lower in participation banks over time. Second, EY looked at 2.2 million comments in online sources about satisfaction with Islamic banks. The report concludes: "Results show that for many Participation banks, consumer satisfaction is, at best, mediocre. ... Participation banks need to seriously strengthen customer experience on offer ..."
Thus, the business challenge for Participation banks is clear. They can point to prominent endorsements from Islamic scholars, which should give them a competitive edge in countries with a substantial Muslim population, and Islamic banks can surely sustain themselves with this loyal pool of potential customers. But do depositors and those receiving finance from Islamic banks end up, over time and on average, with financial products that are on nonreligious dimensions inferior to what they would have preferred? On the other side, if Islamic banks use carefully chosen relabelling of financial flows so that they offer products that are largely identical in terms of financial flows and risk characteristics to what is available from conventional banks, then their identity as "Islamic" banks and their built-in pool of loyal customer may diminish. After all, I'm confident that a number of conventional banks can find ways to link themselves with Islamic values in the minds of many bank depositors and businesses, too.